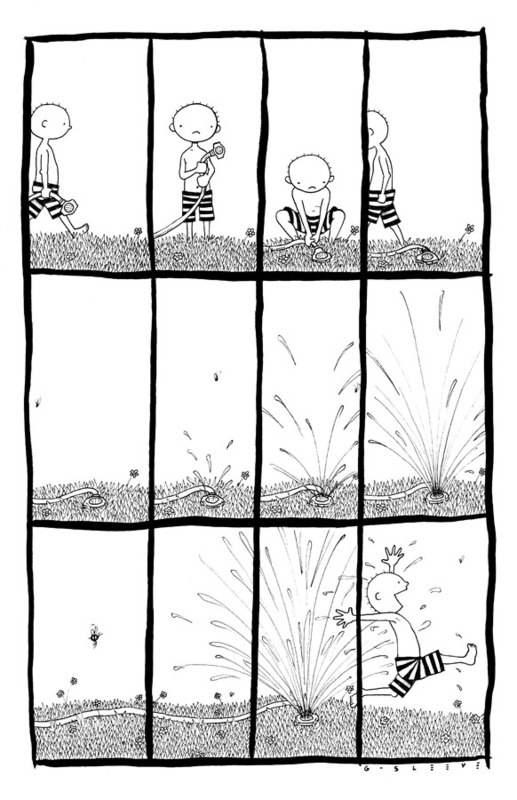 Home > G-sleeve Art > "Being a Kid" Prints by David > "Sprinkler"
The "Sprinkler" print is one of nearly 100 vignettes in the "Being a Kid" series drawn from the boyhood experiences of the artist, David Gildersleeve. This print is based on "actual" events. Click image to enlarge. It’s a hot afternoon during Summer. Boys are home looking for adventure. Then they spot the hose … and it’s attached to the house water line … and there’s a sprinkler head on the end … and then magically it’s turned on and the water shoots upward and outward, just inviting kids to run through and jump around in the cool spray. What could be better? This print (11" x 17") is foam-core backed and suitable for framing, and is perfect for hanging in a boy's room. Kids will be refreshed all year when they see this print that reminds them of the cool frolicking they enjoyed all Summer. Perhaps you will also remember those days when "I was once that boy!"